I would like to say that I arrived in Spain without fully-formed expectations, but that would not be entirely honest. 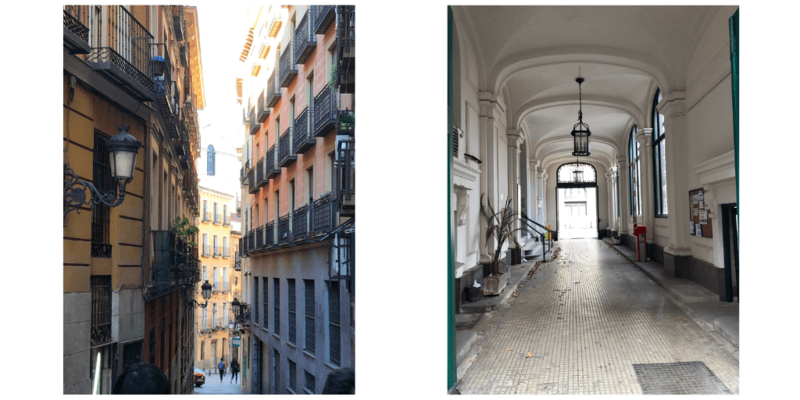 Before arriving in Madrid I spent hours imagining what it would be like to walk down picturesque streets (such as the ones pictured below) and to eat traditional Spanish dishes like croquetas and paella. 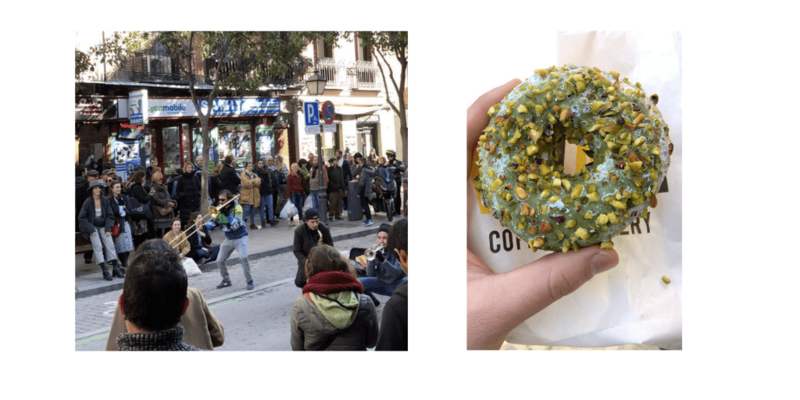 Once I decided to spend a semester in Spain, I began to feel a hunger: the need to make a checklist of “must-have” experiences that if completed would symbolize that my semester away from Amherst was worthwhile. What these objectives boil down to is the desire to validate my decision to leave Amherst behind for my Junior Spring semester. This decision was not an easy one, nor was it made hastily. The whole process involved countless hours of research, loads of paperwork, and many long conversations. My curated list of activities and experience began with the goals I built my abroad search around. I focused on learning conversational Spanish, developing familiarity with Spanish cultural institutions, and gaining a global perspective. Although articulating my goals and expectations for the semester provided much needed direction, I feel as though I also limited myself to preconceived notions of how to make the best use of my time. Many of my favorite moments in Madrid thus far have not been planned but completely accidental. During my first week of classes I walked around the surrounding neighborhood looking for some café con leche. I was so intent on rushing to get some caffeine before my next class that I did not notice how far I had walked. I looked down at my phone and saw how much time had passed, prompting me to look for take away coffee: a staple in the United States. I was shocked to learn on my walk that not a single one of the many cafés on that street sold take away coffee. I later found out that most places in Spain do not sell coffee to go because the norm is to spend a long time sitting at a café socializing. After turning back to get to class on time, I walked past a beautiful garden that I had not seen in my rush to find coffee. 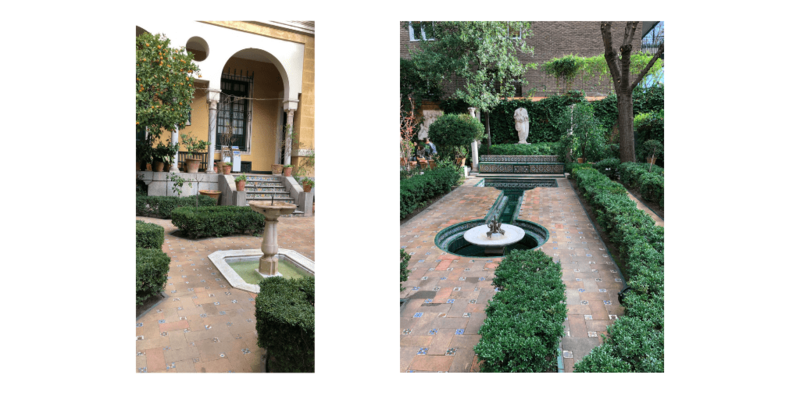 I decided to take a peek inside, and wandered around the gardens surrounding the Museo Sorolla (pictured below). The gardens were breathtaking and reminded me of how amazing surprise adventures can be. I would not have found this amazing place on purpose. In my desire to stick to my plans I completely missed out on what later turned out to be one of my favorite spots in Madrid. I was only able to open my eyes to the beauty around me after my plans went awry. Since then, I have let myself follow my whims from time to time and diverge from set plans. As a result, I have discovered so many places, many of which are often hidden in plain view. Exploring for fun is something I don’t often find myself doing at Amherst. Experiences such as these beg the question: why don’t I make time at Amherst to explore new places? Maybe it has to do with finding comfort in routines, something that is difficult to maintain at the start of a semester in a foreign country. Maybe it has to do with the cold winter weather back at Amherst, which often keeps me cooped up on campus. Upon my return to Amherst for the Fall semester I hope to have an answer to this question and maybe challenge myself to make time to explore. Acting a bit out of character, my first two weeks in Madrid have been characterized by spontaneity. Misguided navigation and wrong turns have led to the most interesting neighborhoods, shops, and parks. Since getting to Madrid I haven’t had the chance go through my prepared checklist of activities and have been trying my best to live in the moment. I think this has been a good thing for me, as I don’t feel the need to constantly compare my experiences to the fantasy built up in my head. I am looking to maintain a flexible mindset, one which lets me grow beyond preconceived expectations. I don’t want to follow a fixed checklist of activities, but I do still want to keep on track of the goals I set up for myself this semester. A perfect example of the flexible mindset I hope to keep is the Sunday morning that I planned on walking around my local neighborhood. I chose instead to ditch my plans and tag along with some friends who were heading to El Rastro, which is the most popular open air flea market in Madrid. I had wanted to explore my local area to spend time practicing my Spanish and to become more comfortable in my section of an unfamiliar city. Instead, I found myself in the middle of a huge crowd, surrounded by a multitude of Spanish vendors and live music performances (pictured below). I was completely outside of my comfort zone, and the experienced pushed me to adapt and find ways to communicate with both vendors and locals alike. Afterwards, I realized that I had achieved my overarching goals for the day, albeit in ways I had not anticipated. As a treat to myself, I ended the hectic morning by ordering a donut at a nearby bakery. All in all, I feel so grateful for the opportunities and adventures I have had so far in Madrid.